Ramblings from an Over-Squozen Brain: Off to Asia!!! Well, today has finally arrived and we're off to Asia. 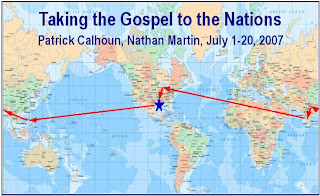 For a little background, I'm traveling with Patrick Calhoun, President of Christians Sharing Christ, a missions agency for which I serve as a member of the Board of Directors. Our goal is to establish 12 new film evangelism teams. We will be traveling to the Philippines, Nepal and India. We had planned to go to Pakistan but there is much unrest in the city we were to visit (Lahore) so we have arranged for the Pakistani brothers to meet us in Nepal. The map above shows the route we'll be taking on our 3 week travels around the globe. We left Central Louisiana this afternoon driving to Dallas. We had originally planned to fly but bad weather forced the airlines to cancel all flights to Dallas. Graciously Jon Martinez volunteered to drive us to Dallas and we have safely arrived and are in the hotel room, getting ready for our departure early tomorrow. Jon will stay the night with us and drive home tomorrow. Our flights will take us first from Dallas to Tokyo (13 hour flight) where we will change planes and head to Manila (4 1/2 hour flight). Oddly enough, because we cross the International Date line we will leave on Monday and arrive on Tuesday night! We'll spend the night there and the next morning catch another flight to the southern city of Cagayan de Oro, the capital of Mindanao. Saturday we head back from Cagayan de Oro to Manila, then on to Hong Kong and finally to Katmandu, Nepal. We'll be there thru Thursday then it's off to New Delhi. We'll fly to the southern state of Kerala to meet with the majority of the CSC missionaries in India. Then finally we'll head back to New Delhi to catch a 15 1/2 hour flight to Chicago, then to Dallas and finally back home to Alexandria on July 20th! Whew! In each of the countries we're traveling to, we'll meet with brothers who Patrick has been in contact with for several months. We'll be interviewing them, sharing the heart of CSC, purchasing equipment, training the brothers in the use of the equipment and in effective Gospel presentations using films. One of the important decisions that we'll have to make is to confirm that each of the brothers should be appointed as CSC missionaires, and even more importantly, which should serve as national director, our primary contact for the missionaries in each country. We would deeply appreciate all your prayers. I'll do my best to update this blog with info, pictures, etc, as the trip progresses. Thanks again for your prayers and support!